You probably wouldn’t expect to find a mansion-like Italianate villa in the suburbs of Chicago, but that’s precisely what you’ll find in this historic home, built in the early 20th century for Samuel Insull, the founder of the General Electric Company. The mansion takes its name from its later owners, John Cuneo Sr. and Julia Shepherd Cuneo. 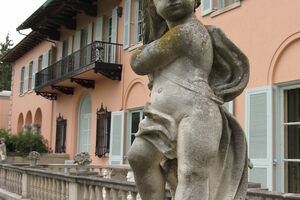 Cuneo is modeled after an Italian villa. Their family lived in it for over 50 years until 1990, and left behind quite the collection of domestic marvels. On the first floor, is the family chapel adorned with specially designed stained glass and consecrated by Cardinal Stritch of Chicago—who received rare papal permission to consecrate the private chapel. On the same floor, is the Ship’s Room, whose walls are covered in paneling from the captain’s quarters of a 17th-century ship. This study also includes a private telephone booth and a Middle Eastern harem screen. Also on display is the Cuneo family’s silver collection, the trophies John Cuneo Jr. won in equestrian events, and a collection of Capodimonte porcelain from Italy. Loyola University now owns the grounds and has converted some of the rooms into classrooms.